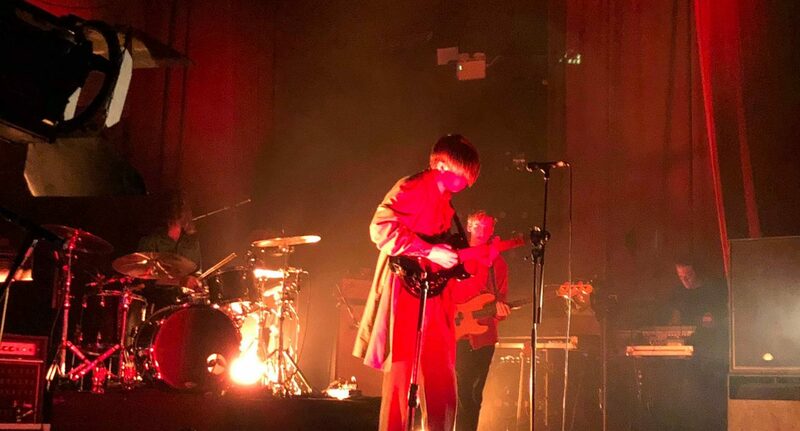 The atmosphere at The Ritz for the third date of Drenge’s ‘Strange Creatures’ tour was a surprisingly subdued affair, especially for a Friday night in Manchester. A steady line trickled into the venue as I waited patiently at the box office. This soon became a growing queue but considering the excitement towards the band that I had previously seen, I was a little taken aback. The fact that it continued to get busier as I waited was promising, I suppose. However, I couldn’t help but feel slightly concerned that there was a distinct lack of knowledge about the gig in the first place. This, paired with a sudden surge of interest, certainly affected the cohesion between the build-up and the supporting act, Valeras. Consequently, during the supporting set, the entire venue seemed to be woefully empty despite the brilliant musicianship and charming nature of Valeras’ performance. Valeras are a five-piece band hailing from Reading who I had previously seen in a stellar supporting set for YONAKA during their ‘Don’t Wait till Tommorow’ tour. Their unique blend of natural sounding guitar riffs and genuine rapport meant that I had expected nothing less but an assured sonic quality and performance. Their single ‘Painkiller’ has the pleasant appeal of an indie track but their latest single ‘Nunca Morirá’ provides a darker sound that has brooding undertones. This track stands out as you could truly see the enjoyment that the band got from playing this track together. A less than impressive moment for me is the cowbell used which, to put it politely, is quite intense. I understand why it remains as it is it a rather quirky feature of their set but with the success of their latest track, I hope this part will diminish significantly. The headliners of the night, Castleton’s Drenge followed with surprisingly minimal fanfare and a quite startling lack of stage presence. Perhaps I am missing an ironic point here but with a tour title like ‘Strange Creatures’, I had certain expectations. After listening to the new album I had gathered there would be a turning point. It suggested to me that there might be something wild about to break out across the stage, perhaps a feathered creature as depicted on the posters. Maybe this was veiled optimism and the reality of this was quite slim, slightly terrifying but nevertheless interesting. You can imagine, then, my mild disappointment when the band’s lead singer walked out in the wild apparel that is a trench coat. A trench coat. Still, I remained undeterred as the first notes rang out and some pretty spectacular lighting flooded the stage. It revealed that the point of the album’s title is truly reflected in the band’s lyricism and the disregard for conventionality in their instrumentalism. Tracks such as ‘Bonfire of the City Boys’ have a spoken quality about the lyrics which is refreshing to hear alongside a palpable bass line. It cannot be denied that Veleras provided a night of music which was both fun and at times thoroughly engaging. Despite my trepidation around image and sound originality, a lacklustre crowd is not necessarily the fault of any band. The continued hard work of Veleras is clear across their recent supporting slots. As their sound develops it brings a refreshing take on the cultural diversities that are close to the band’s heart. A good setlist and fantastic lighting design saved the day all in all.